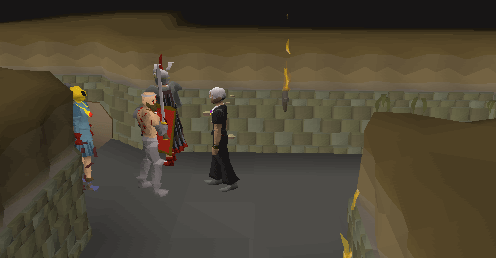 The Edgeville Dungeon is a place where people can go to train, make money, and mine. The dark, twisting tunnels can easily get confusing. You may want to know the inhabitants of the dungeon, how to navigate to those places and more! 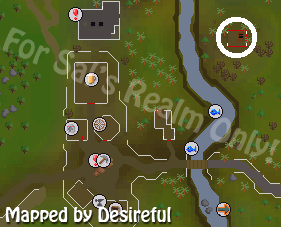 There are several different ways to get to the Edgeville Dungeon. 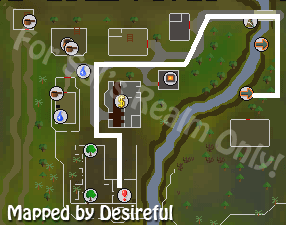 There are two ways to walk to Edgeville Dungeon, only because there are two entrances. The first entrance is located by the Cook's Guild and requires a Brass Key. 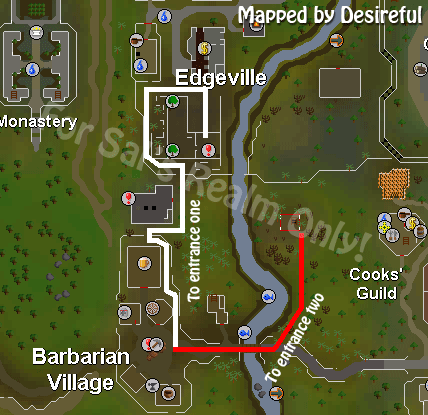 There is another entrance, but it is actually in the city of Edgeville. It is by the Yew Trees. This entrance is simply a trapdoor that leads into the dungeon. The second entrance is the one most people enter through because all you have to do is climb down a ladder and you are in the dungeon! This way you won't have to hassle over a key. You can also use an Amulet of Glory. Please note that this option is members only. Use the amulet and select Edgeville. You will then be teleported to Edgeville, which of course is where the Dungeon is. Just walk over to the dungeon by the Yew Trees. This option is members only, and you must have started A Fairy Tale Part 2: Cure a Queen. The combination is "DKR". 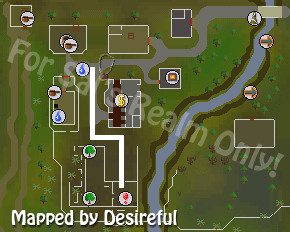 Once landed, follow the map below to get to the dungeon. If you have a Skull Sceptre, you can use it to teleport to Barbarian Village. From there, you can walk in two different directions. 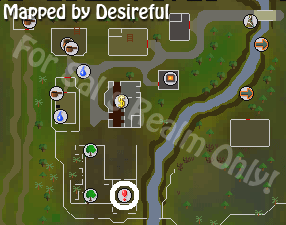 You can head north into Edgeville, or go east and use the entrance by the Cooking Guild. You can also get to Edgeville by riding on a canoe, through the River Lum. 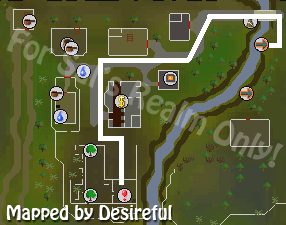 Follow the map below to get from the canoe to the dungeon. 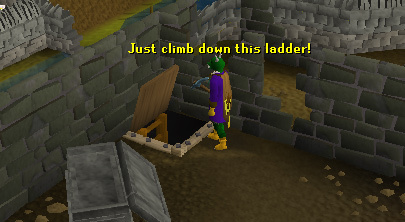 We will be touring the dungeon from the ladder south of Edgeville's bank towards the entrance that requires the Brass Key. There is a secret room just to the north which is entered by pressing on the strange wall. Rather useless, it contains rats and a few chests. This is the gate which leads into the Wilderness. This entire section is Members-Only, so you must be on a Members server to access it. When you first enter the Members area of the dungeon you will enter an area with some Thugs in. They are level 10 and there are also 5 chests near them that you can open and close for fun. Just north-west, past the thugs, you will find Chaos Druids. They are often killed for herbs because of their low level of 13. They are aggressive, so many people like to train here. Past the Chaos Druids, continuing north, you will find a gate. Past the gate are a few skeletons. 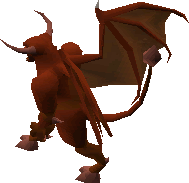 To the west are three Black Demons which are level 172. 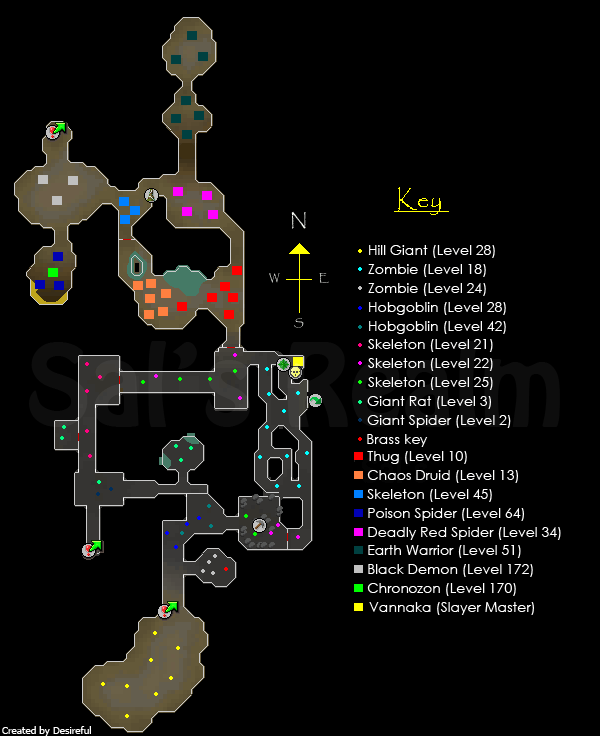 They are often killed for Ranged experience because there are quite a few safespots. 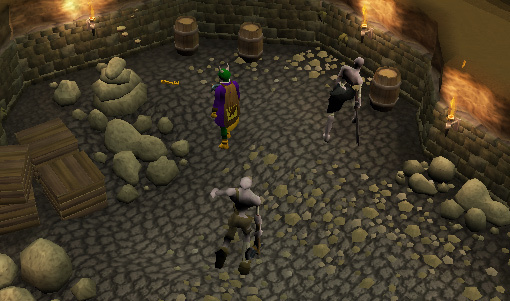 They are also killed as Slayer tasks. If you decide to continue north, you will encounter a ladder. At the top of this ladder, you will find the Air Obelisk in the wilderness. Beware: Revenants can make their way up here. South of the demons is a room containing Chronozon, a monster killed during the Family Crest Quest. 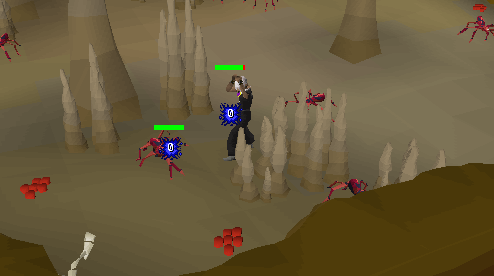 There are also Poison Spiders in this room, so when getting to the place to mage Chronozon, it is recommended to put on the Protect from Melee prayer. It is also wise to bring an Anti-Poison Potion. If you continue east from the skeletons, you will find Red Spiders. There are also Red Spiders' Eggs spawns around the room. Heading north, you will need to pass an Agility obstacle, requiring level 15 Agility. There are an abundance of Earth Warriors. 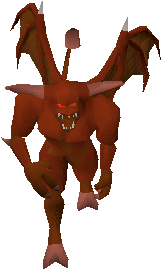 They are level 51 and it is a popular location for people to train, including both, Slayer tasks and just general combat training. A few people also kill Earth Warriors for charms. That covers the members' wilderness section. 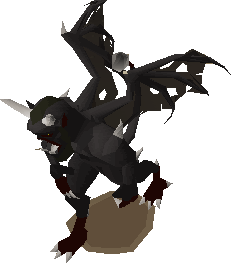 All the way back at the gate, if you head east, you will encounter the Slayer master, Vannaka. Vannaka will also help you in the Varrock Tasks. South-east of Vannaka, you will see an Obstacle Pipe. 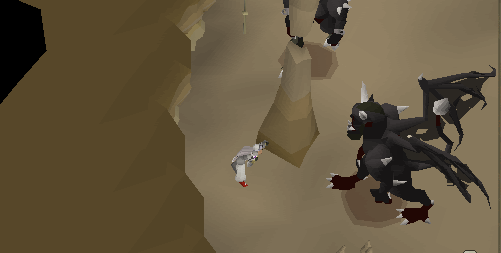 Crawling through this pipe will finish one of the Varrock Tasks. 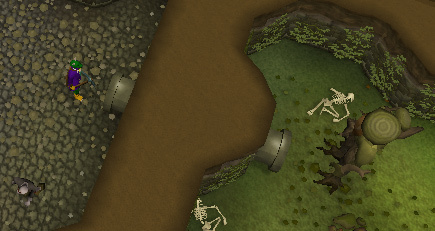 It connects to the Moss Giants in the Varrock Sewers. Head south and you will reach a gate. Just past the gate, there is a mine with many types of ore available. In the mine, there are 2 Adamant rocks, 1 Mithril, 6 Coal, 2 Tin, 3 Iron, 2 Copper and 3 Silver rocks. If you head west from the mine, you will reach an area full of Hobgoblins. There is also a brass necklace spawn in the corner. Head south a little and then head east to enter a room full of Zombies. 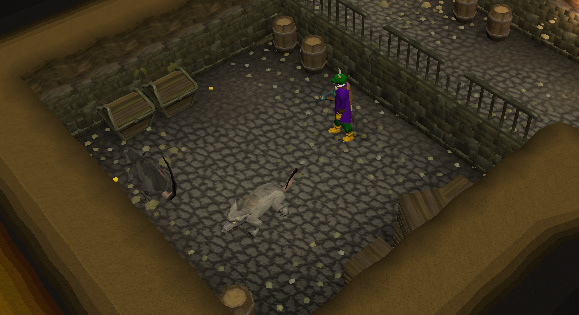 The Brass Key, which opens one of the entrances of Edgeville Dungeon, spawns on the floor. Continue to the south to reach the main highlight of the dungeon, the Hill Giants. 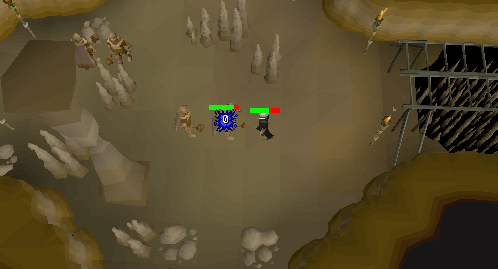 Many people train here with Range and Melee. They are also often killed for money by selling their Big Bones. The Hill Giants here are also sometimes trained on for Slayer.